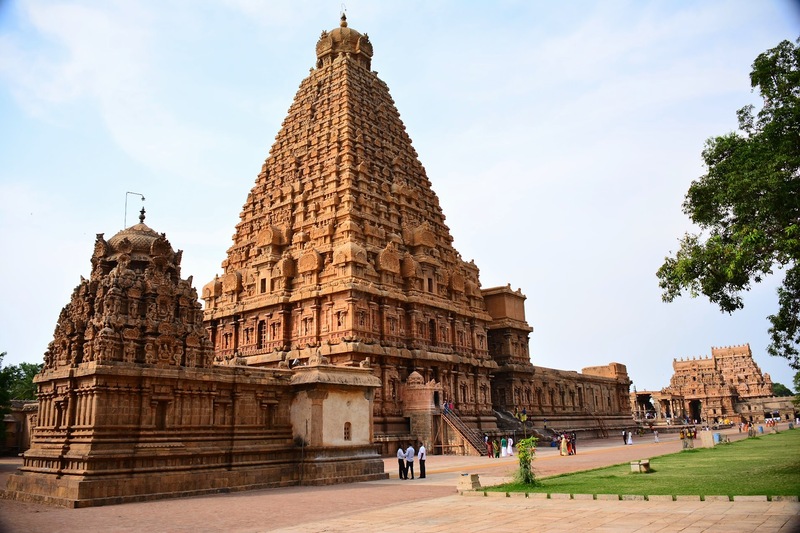 Continuing with my Travelogue of the Great Living Chola temples, this episode will cover the Big Temple, Tanjore, Tamilnadu. 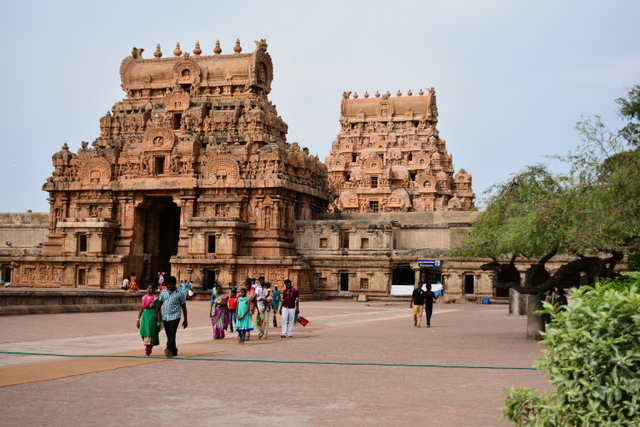 The Big temple or Brihadeeswara temple or Peruvudaiyar temple in Tanjore was built by Chola Emperor Arulmozhivarman also known as Raja Raja Chola I. The Big Temple was the last place to visit on my day long itinerary. I had already had a wonderful day visiting and praying in temples. My first was Gangaikondacholapuram and the next was the Airavateeshwara Temple in Darasuram. Big temple was the furthest from our home in Pondicherry. So I had decided to visit it last and this turned out to be the best decision of the day as, even 4 hours later I was not done. We parked the car in the parking lot and then I crossed the road and walked towards the entrance of the Temple. The Temple has an outer boundary wall, surrounded by a moat, with an opening and a gopuram on top, known as the Keralaanthangan Gopuram. 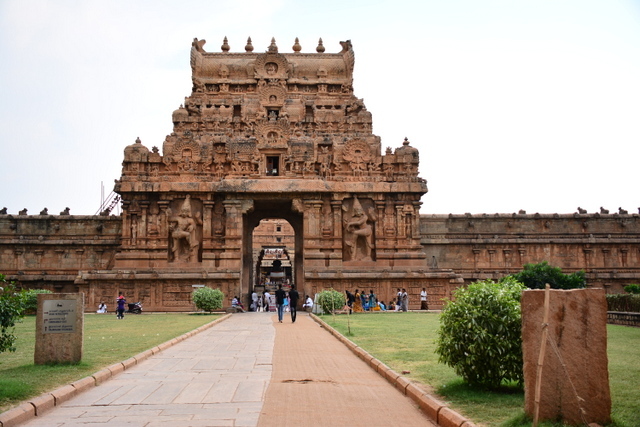 This is succeeded by a second wall with an entrance aligned perfectly with the first, complete with a gopuram and huge carved Dvarpalas on either side known as the Rajaraja Gopuram. Second inner entrance with Rajarajagopuram tower with 2 Dwarabala statues or guards of the entrance. Once you cross this second entrance/gate, you walk into a courtyard replete with columns on the inner side of the wall. 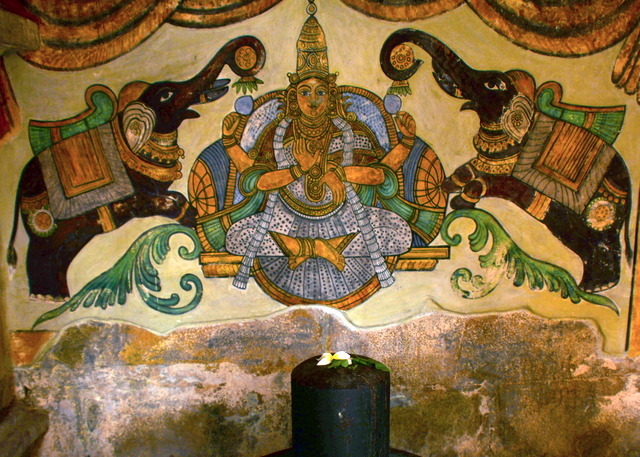 This wall runs around the temple fully covered and has paintings all over its walls and many lingams. 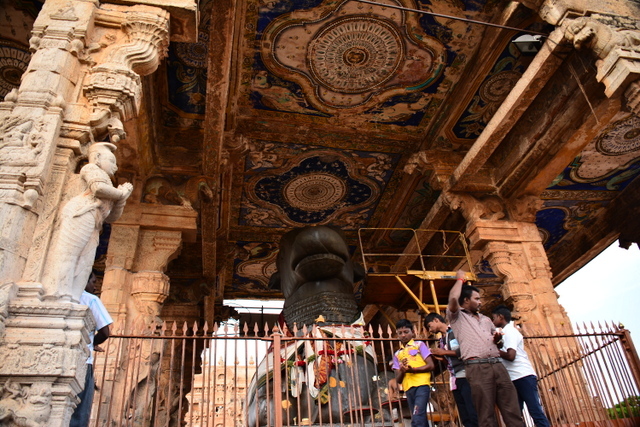 Right in front of you is the huge monolithic Nandi statue housed inside Nandi mandapam. After praying to the Nandi, I walked towards the side of the main temple, the stone carvings were stunning and it just drew my eyes to them.The main Temple is imposing, colossal structure rising nearly 216 ft high into the air, I had to move away from the structure to see the magnificent capstone at the top ( I missed carrying my binoculars , it would have been a great help here ) of the gopuram. 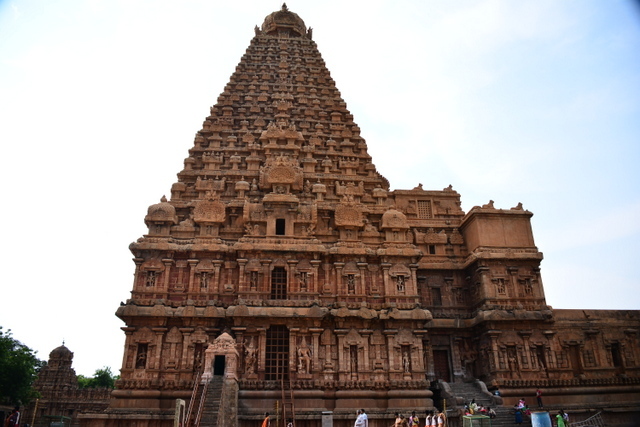 This 80 ton marvel carved out of single stone and is said to have been carried by elephants on an inclined plane from nearly 1 mile away to the top of the gopuram. 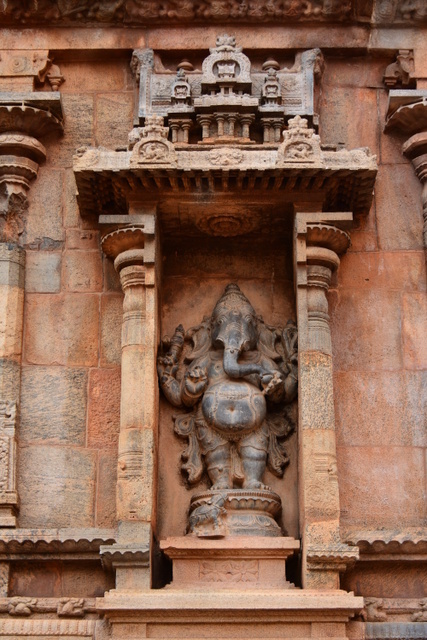 The outer walls of the Temple are adorned with many intricate carvings of the deities in various forms. Also carved into the walls are 80 of the 108 mudras (poses) of the classical dance Bharatanatyam. After walking around the temple once, I decided on walking under the covered wall encircling the Temple complex. As i started walking, I came across some stunning frescoes painted across the walls accompanied by Shiv-Lingams of many sizes. These paintings looked nowhere near 1000 years old, how could they be so clear and vibrant? The answer was there in the museum where it says that the artisans used natural dyes made from plants, flowers, minerals and salts. This made me wonder dreamily about how grand these might have been a millenia ago.The king is said to have loved art, so he had the walls painted end to end, so that he could enjoy these paintings everytime he circumambulated the main deity. He also had these paintings specially painted away from the main Temple as he felt that not every one of his subjects might enjoy art. Frescoes are basically paintings painted over a wet lime plaster wall before it dries. So an artist basically has a maximum of three days to complete his project. As I walked along the corridor, I could feel how the emperor must have felt walking by these paintings in solitude, it must have been an ecstatic experience. I sure felt so even though I did not have the weight of the world over my shoulders. I was awed and angry at the same time. Awed at the kind of art these artisans had created and angry because a lot people had thought it was an intelligent way to get famous by writing their names on these walls. This art on wall had survived time, being painted over them, mother nature itself in the form of earthquakes, rain, sunshine etc but it has all chances of losing its lasting beauty because the modern generation has no respect for their past glory and decided to vandalize them by writing their name here. It took me nearly two hours to completely go through the art on walls. I then decided to go into the main Temple. I first prayed to Lord Ganesha, then proceeded to pray to Sri Karuvur in the Karuvur Shrine and then prayed to Lord Muruga in Murugan Shrine. After this I proceeded into the main shrine, the Brihadeeshwara shrine. As I walked toward the main sanctum sanctorum I was again greeted by beautifully crafted sculptures on the pillars, paintings on the walls and ceilings of the dark corridor. As I stepped into the main chamber to pray, I suddenly felt an inexplicable energy surround me, I walked towards the 12 ft high Shiva-lingam in front of me in a trance listening to the soft chants in the background. I prayed to Lord Siva, got blessed by the Priest who gave me some prasadam, flowers, kumkum and holy ash. I walked out and paid obeisance at Chandigeshwarar’s shrine, Nataraja’s Shrine, Brahannayagi’s shrine, Hanuman’s Shrine and at Sri Dakshinamurti’s statue. I then went on to see many other beautiful paintings leisurely of Dancing Siva “ Natraja” , Tripurantaka Siva accompanied by his sons Ganesh and Karthikeyan in a chariot driven by Lord Brahma, another of Lord Siva as Dakshinamurti, the celestial elephant Airavata, one of the dancing girls and one of Rajaraja Chola himself with his Guru Karuvur Devar, the only image/painting of the Emperor in existence. Besides these paintings, there are beautiful carvings on wall and sculptures of Gods and Goddesses in many forms and manifestations. Painting of Goddess Saraswati done during Nayak period when the temple got its name – Brihadeeswara Temple. The paintings were done on top of the old Chola paintings and is more gaudy. The temple also has beautiful inscriptions in beautiful calligraphy of the Emperor and his family’s contributions, gifts, donations to the Temple in the form of land grants, jewellery, coins, gold, cows, sheep,etc. It took me over 4 hours to completely see the Temple and enjoy the art & architecture. Many a time I imagined myself in those times, it must have been interesting times to live in, in a prosperous kingdom under the aegis of the all powerful Emperor Rajaraja Chola. 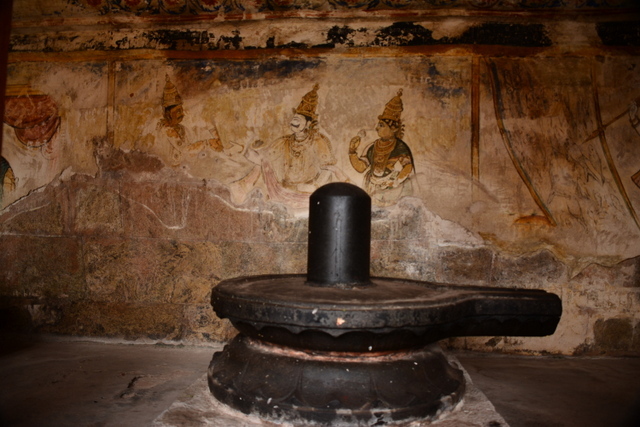 Chola paintings in a dilapidated condition with the lingam in the front. I would suggest an early morning or late afternoon visit as the stone floors gets really hot. I would also suggest a working day in the early hours as the most ideal time to savour the architecture in silence and not having to hurry through any part of the experience. Avoid Mondays, Mondays are Lord Siva’s special day when devotees line up to pay obeisance. At a staggering 216 ft , the big Temple the tallest Temple to be built ever. 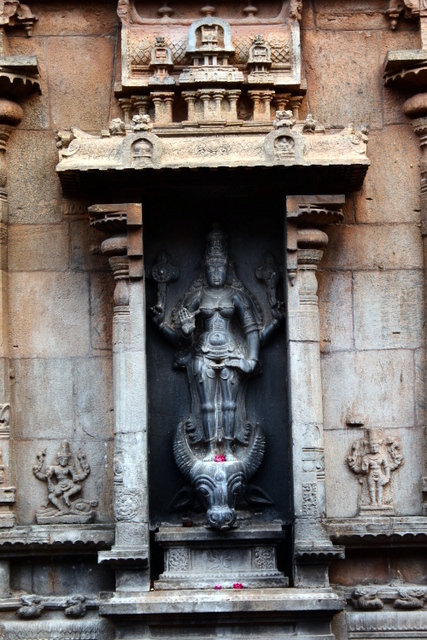 The Nandi statue at the entrance is carved out of a single granite stone. The original name of the deity was Rajarajeshwar, it was the Marathas , who later ruled Tanjore gave it the name Brihadeeshwara. The Temple was built using Vaastu shastra as a guide. The lineage of chief architect of the Temple Sri Kunjara Mallan Raja Raja Paranthachan survive till date and still practise Vaastu Shastra. More stone than the great Pyramids of Giza was used to build this Temple. The Frescoes in the Temple are nearly 500 years older than the ones completed by Michelangelo in the Sistine Chapel. The huge Capstone of the Temple is constructed in such a way that the shadow never falls on the ground at noon in any season. 1000’s of elephants were used to build this temple. There is not a single granite quarry near the temple, only one exists which is 60 kms away. So sourcing the stones for the Temple itself must have been a huge task. It is said that a ramp was constructed nearly a mile long and was used to transport the 80 ton capstone to the top of the main gopuram. Quarrying of granite even to this day is hard to do with modern implements, so it must have been much harder to do in a time when soft iron was the only available metal to work with. The technique used to quarry stone was ingenious. The stonemason first decided on the stone to be quarried then he started to chisel out the granite to create a series of pockets in a line. Then he would plug the pocket with wood and then pour water over the wood, the wood would slowly expand and would thus create a crack in the stone. There are many secret passageway to and from the Temple. 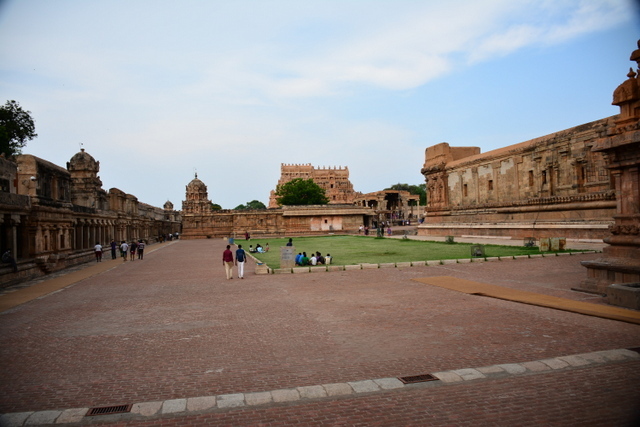 Some led to the Royal Palace of RajaRaja I. It is also believed that some of the paintings was done by Rajaraja Chola I himself. The original paintings were painted over by the Nayaka rulers , which was revealed by historian and archaeologist Professor K.V. Govindaswami, whose keen eyes spotted the painting behind the peeling of the paint from the Nayaka period. The Temple has gone through many restorations and still is undergoing restoration. A lot of construction was done by the later Maratha rulers too. The Pandya king who later ruled this area burned the temple and the areas nearby in an attempt to stamp out the Chola king’s work of art. The Temple till date has survived 6 earthquakes. Many of Temple’s riches in the form of jewellery, gold and bronze statues were looted over and over by Muslim rulers. At one point the Temple priests hid a lot of these statues and gifts given by king in the secret passageways so that they could not be looted, today no one knows where these treasures are hidden. They took the secret to their grave.